Using YouTube to deploy video on your website. Last week, in a blog entitled “HTML5 for Video Assets”, we discussed the most universal formats of video for deployment on the web. I wrote about HTML5, as it applies to video, and discussed the pros and cons of using it instead of what was once considered the most universal format for video on the web – Adobe® Flash®. After writing that blog, I decided to upgrade my website and use HTML5 video. Doing so allowed my videos to be viewed by a wider audience – including the segment of the audience with Apple mobile devices. For those of you who had not heard, Apple has chosen not to support Adobe Flash on any of its mobile devices. That includes the iPad, the iPhone and the iPod Touch. More recently, Adobe has decided to abandon Flash for mobile devices. So regardless, moving away from Flash video on my website, was the right move for me if I want my video to be viewable on ALL platforms. Since then, I have upgraded again. I didn’t exactly move away from HTML5 video, I just changed the way that I deploy it. For me, the easiest and best way to embed video, in a format that everyone can use, is to upload the video to YouTube and embed their video player. • The video is playable on all browsers, including Apple’s mobile browsers on iPads and iPhones. • YouTube has a built-in player, so I don’t have to build my own. • I don’t have to encode the video to multiple formats (YouTube recommends that you upload the original file). • I'm not taking up space on my web server for video files. YouTube makes it easy; as long as you own all the elements of the video, it is eligible for upload to YouTube. YouTube does all the online encoding behind the scenes and if you upload the original format, you future-proof your content. As better online codecs are made available, the YouTube video will incorporate them. YouTube will supply you with the necessary code to embed the video player into your web page. If you want your content captioned, there is a built-in speech-to-text extraction feature. YouTube will automatically generate a text caption for visitors who may be hearing-impaired. It's also very easy to correct any mistakes that may have been made in the conversion. The added bonus of serving your video from YouTube is that it helps increase your search engine optimization (SEO). 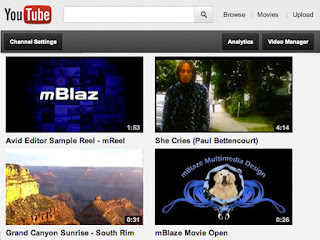 People can find your website because the content of your video will now come up in searches.